During its second week of its summer season, the Rockport Chamber Music Festival, presented “An Evening of French Music” at the Shalin Liu Performance Center. Drawing mostly from the start of the 20th century, these famed French composer’s unique styles and the rotating instrumentation brought a pleasing variety. The five performers each had very distinctive personalities as well, that brought a certain je ne sais quoi for a cohesive and elegant spectacle. Flutist Sooyun Kim and harpist Franziska Huhn began the program with a poised and energetic interpretation of Faure’s Fantasie, Op. 79 for Flute and Harp. Kim’s playing and theatrics set a high bar for the performance: directly addressing the audience with wide eyes, gracious movements, and her firm yet silvery tone. The music dwelled in a simpler, calmer space, until the piece’s velocity and harp accompaniment developed and heightened. 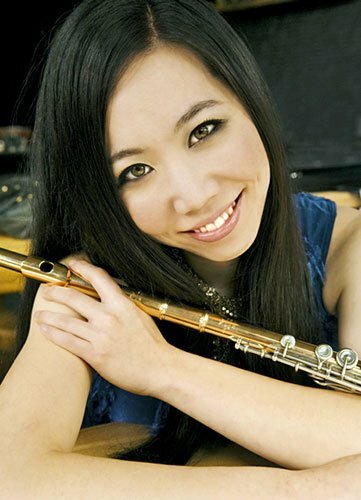 Kim won me over by maintaining her comfortable extroverted demeanor while effortlessly spitting out Faure’s virtuosic writing – the rapid runs and whimsical arpeggios that have made this piece one of the cornerstones of flute repertoire. Huhn, though not to be faulted for giving a more reserved performance than Kim, did seem a bit nervous entering for Caplet’s Deux Divertissements, bursting into the music as soon as she sat down. Nonetheless, her playing didn’t show it. Though now known mostly for his working relationship with Debussy (conducting premiers and orchestrating some of his piano pieces), Caplet’s personal voice spoke strongly in these pieces, especially the first movement. Relative to the Faure, which was a piano reduction, the Divertissements included a wider array of harp techniques: palm dampening, harmonics, varied textures, glissandos, rolled chords, octaves, etc. Huhn’s narrative sense and dynamic shaping provided a full & satisfying aural experience. After a bashful smile to the smattering of applause between movements, the second movement brought to bare a more masculine, Spanish-influenced style. The resonance and textures (especially on the low notes played sul pontacello) sounded more similar to writing for guitar, though, at the climax, it grew to ecstatic moments of ravishing chromaticism and virtuosity that harkened back to the first movement. Directly addressing the audience before beginning, baritone Randall ta outlined some brief historical and aesthetic context for about Ravel’s Chansons Madacasses (Madagascar Songs). Having composed the piece shortly after hearing Schoenberg’s Pierrot Lunaire, Scarlata cited that although Ravel denied any a direct inspiration, he conceded that he “couldn’t have written it without hearing [Pierrot Lunaire] first.” The sensual and political directness in the lyrics scandalized the audience at the premiere, causing them to walk out on the performance — while the accompanying music for piano, flute (doubled on piccolo), cello assuredly served to alienate them as well. Familiar with Ravel’s Impressionistic music, it was an adventure for me to hear the composer’s foray into Expressionism. After Scarlata’s introduction, I admit that I over-prepared myself for a strange vocal aesthetic. To my surprise, I was comfortably whisked away with his gentle yet sturdy tone. While the music felt very much within Ravels style (oscillating melodic patterns that metrically reorient themselves as they repeat) the harmonies conjured a starkly different emotional atmosphere than much of his other work. The first movement was more alluring than uncomfortable, but the comparisons to Schoenberg grew more tangible as the piece continued. At the start of the second movement, the emotional energy grew more intense and more alien. After a few surprising and explosive moments, the performers withdrew for one of the more intimate moments of the night. Piano and cello combined to create a mass of sound in the background, as the baritone pattered and lamented above them. The music slowly but inevitably accelerated, rising in pitch, and eventually reached a dilapidated groove. Reflections of sweat grew more visible on Scarlata’s forehead as he let out some forceful, sustained high notes at the movement’s climax. The movement ended on a somber emotional note, with an unfortunate codetta by an audience member’s Nokia ringtone – the performers fared admirably in maintaining the intense mood through the painfully long interruption. The last movement featured some of Ravel’s excellent flute writing—teamed with some haunting cello harmonics. Overall Scarlata’s French was quite clear and comprehensible, aided by his voice’s crispness and lightness, despite a hearty fullness in tone. It was a wonderful departure from the first two pieces, and demanded the space to process it that the intermission afforded. After the break, we moved ahead to a post-impressionist style for Poulenc’s Sonata for Flute and Piano. Focusing primarily on melodic possibility, Poulenc’s unique style captures an essence of modernity though has a more conservative musical vocabulary of mostly diatonic pitch collections. Pianist Pei-Shan Lee brought a relaxed, yet firm concentration to the stage, which of course, seemed a bit stern relative to Kim’s presentation. However, the counterpoint of personality served the music well. The work provided another opportunity for Kim to exhibit her exceptional technique, all while projecting the emotional narrative with her exuberant stage presence. While there was a fair amount of spotlight-sharing, Cellist Sophie Shao radiated throughout the final selection of the night: Debussy’s Cello Sonata. Shao’ passion, along with her elegant and effortless technique, made for vibrant cantabile playing, even with the extended sections of pizzicato in the 2nd movement. Her phrasing had an elasticity to it: even in the more reserved moments, the inevitability and potential energy buzzed in her tone. Lee came out of her shell a bit more, perhaps having to tackle a more robust piano part. She demonstrated her timbral sensitivity, portraying the richness of articulations and color in Debussy’s orchestration. The pair gave a stunning performance of the work, certainly the quickest 11 minutes of the night.